Welcome May! I'm looking forward to all those flowers you should be bringing us, especially after all the April showers we had here. It is also time for another hop from the Designer Crafts Blog Group. This month you will find ideas for Mother's Day or Father's Day or Birthday's. I'm looking forward to seeing what ideas everyone will be sharing. I am choosing to only focus on Mother's Day for now but may be adding something later this month for other themes. The annual day to celebrate Mother's is this coming Sunday. We will gather with the paternal matriarch of the family for brunch. The mother of nine children, grandmother of 21 and great-grandmother of 19 (with 2 more arriving this summer). I, unfortunately, will only have memories of my own mother to celebrate. It is because of her I will begin with two ideas that I have previously created for her. I do love using a mix of mediums when I create and both of these projects follow in that use. Here is a inexpensive collage frame that I altered by changing the color and then adding a variety of photos, and embellishments that represent my mother. NOTE: This project was found in a issue of "Crafts n' Things. I apologize for the glare on the photo, this was taken a few years ago. This project was created using a children's board book. The surface of the book was first altered with papers and paints. It then tells the story of her life with photos and journalling from a daughter, to sister, to wife, mother, grandmother, great-grandmother and friend. NOTE: This project can be found in a book titled "The Altered Book Scrapbook". These are the type of gifts that I enjoy making and sharing to honor those who are meaningful to me. These same ideas can be used for a sister, brother, child, husband or friend. So now it is May and everything around is budding and sprouting. The crocus' have bloomed, some daffodils are still blowing in the wind, the tulips are opening with added color to the landscape and the flowering shrubs and trees are showing off! Most people love flowers - many types and at any time they always are welcome. That makes flowers the way to go for many gift ideas. 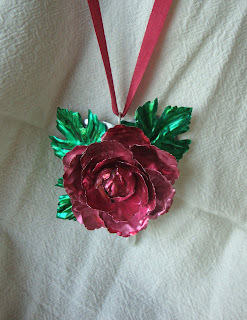 I used the latest punches by McGill, called Paper Blossoms to make this necklace. A peony was shaped with the required punches. After some experimenting, I found that a thin metal could be used to punch the flower shapes. Also I try to fashion something with more then one purpose. Beside the use of this flower as a necklace, it can be removed from the ribbon than used as a lapel pin or pinned onto another item as an embellishment because a pin back was also applied. Maybe you will find some inspiration before Sunday and make something for a very special lady in your life. I hope you will continue to take time to hop through the blogs of the group of designers who participate. Also there is also another "give away" being offered by Julie McGuffee. Please check out her blog for information.